What metal speaks to our human core more than copper? The shine across its surface, those ripples of cold, reflected light – an impenetrable, brazen mass. It’s been a vital element throughout human civilisation, used for centuries to craft weapons, shields, jewellery, monuments and timeless works of art. No other material contains the same sort of glimmering mystery, so what else could make a bold yet sophisticated statement than a solid copper boardroom table from Mac&Wood? 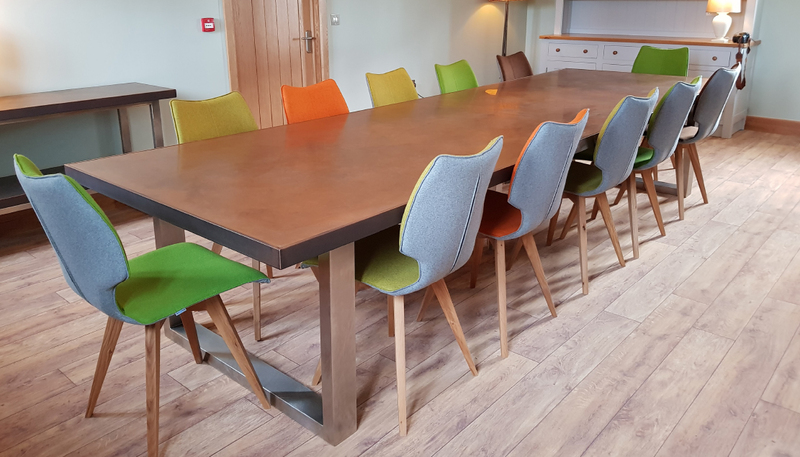 A copper boardroom table from Mac&Wood evokes a sense of tradition like no other material, and our designs add a perfectly contrasting modern appeal that you won’t find anywhere else. This ancient material will imbue your business space with a sense of eloquence that commands respect through sheer power. It truly is an authority unto itself, a statement of strength and beauty. Copper’s natural radiance makes it an ideal choice for any office or boardroom. It seems to glow even in the dimmest light. What’s more, the copper will subtly change hue as it oxidises to reveal a whole spectrum of colour and depth, from subtle pinks to bright reds, ruddy oranges, purples, gleaming yellows and greens. As it ages and comes into continual contact with human hands, its patina will continue to change and develop – a living record of every successful meeting. Beyond its bold aesthetic, however, copper epitomises our philosophy here at Mac&Wood. It is friendly to the environment, comfortable to the touch, and durable enough to last more than one lifetime. This is no mere metal: it is a clear declaration of intent for generations to come. And with the guidance of our skilled professionals, you can infuse each table design with your own flair and characteristics. Simply get in touch to request any bespoke features. Your Mac&Wood copper boardroom table is no simple object – it’s an expression of your human core.